Allen Tate Company, the Carolinas’ leading real estate company, announces the opening of the Wesley Chapel office, in The Village Commons shopping center at 6330 Weddington Road, Suite A- 2, in Wesley Chapel. The retail center office is a flex space, catering to various work styles of up to 25 Allen Tate Realtors® and staff, including those who prefer to work on the go. It features an open floor plan, agent offices, video displays and conference space. “Our new Wesley Chapel location is convenient for customers in Wesley Chapel, Weddington, Indian Trail, Stallings, Monroe and other nearby communities. Located directly in front of Target, we’re easy to find. We are excited to be part of the Wesley Chapel community and look forward to helping families in the area with all of their real estate needs,” said Wendi Hensel, Wesley Chapel branch leader. 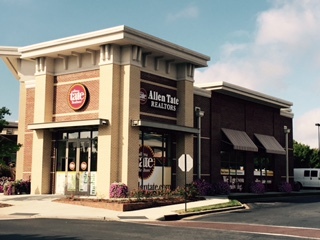 Allen Tate Company operates 41 branches in North and South Carolina, including 23 in the greater Charlotte region. To reach the Allen Tate Wesley Chapel office, call 704-234-5322.